It feels heavenly indeed, when I manage to discover an artist who I consider as good as anything I've ever witnessed in my relatively short but spectacularly rich experience with art. 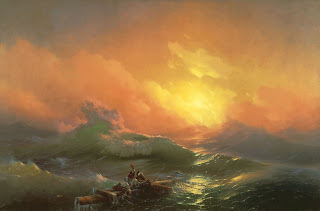 The above painting is one such example of a rather obscure artist, Ivan Aivazovsky, that really imposes on me the will to look more on the brightside of life and I can thus enjoy a respite from the toil of intellectual pessimism. Romanticism is healthy for the mind and there is no question that this is indeed true. Although the painting above portrays people clinging to the badly damaged mast of their crippled ship and the so-called '9th Wave' is certainly about to consume them in one go, there is the wonderful balance between the delight in nature against the fragility of human physicality. Spirituality is what counts here and the people depicted are nevertheless hopeful, even for a miracle to save them, but still remain faithful to their hopes. For once I have undoubtedly found a painter that matches the formidable Sublime of Friedrich without letting go of realism like Turner or plunging into the unneccesary Romantic nationalism of Delacroix. Applause is what's left, and pride of course. I do not believe you are 16. I've been reading your blog and it's fantastic. You write beautifully and have such a mature insight. Also, you have pretty good taste in music. Just wanted you to know that your writing really speaks to me, as good writing should do. Whoever said Friday 13th is unlucky! Your comment is an invaluable motivational tool for me.